Entertain your guests with a casino night on New Year’s Eve. No matter what and how your year 2018 went, the excitement and buzz are still the same to welcome New Year’s Eve. The parties and events in the U.S have always been in a limelight. Rock the party this season with BAM casino parties and enjoy the real fun at home or at your desired places. We are ready to assist you from a scratch until the end. Rock your party, be the rhythm to welcome new year this season with the open arms. Create a memorable environment, cherish a spectacular night of music, entertainment, fun, games with the welcome drinks and buffet menus. New Year parties are one of the most awaited events to let you experience all the fun and excitement. With BAM Casino Parties you can definitely add an exciting tinge and glamour of Las Vegas to your New Year’s Eve. Your guests will remember this as a fun night and will be always waiting for your next party. Whether you want a family reunion, or whether it’s an official party, we will definitely add thrill to your event. The new year parties start approx. a week before and lasts until the weekends so it’s really important to provide a safe and fun-filled celebration for all your guests. Be a party freak, get your sleeves up and have a blast this new year. BAM Casino Parties offer customized packages for your evenings, whether it’s a small reunion or a huge birthday party. We let you enjoy in a smooth and easy way. Do you really want to add thrill and excitement to your new year casino party in San Francisco? 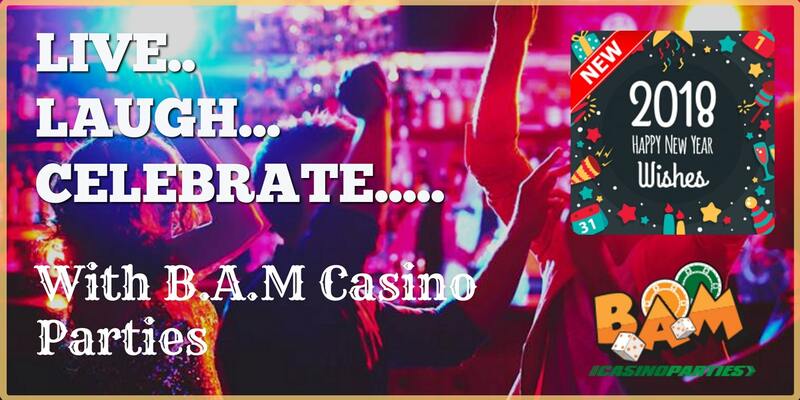 Enjoy fun-filled games, awesome food, all night buffet, and party hard like there’s nobody watching, then BAM Casino Parties can be the best to fulfill all your needs. Casino games are a whole night entertainment package for you. We can set up the entire equipment, casino tables for you and give your loved ones a complete entertainment package for the entire party. Various other activities may include dances, entertainers show and lot more to have fun. We let you create memories for the most awaited events. Go crazy with the flow, enjoy all the casino fun with our most exciting games. We know what a rush of reels, the sounds of balls, the dices and the click of roulette means to you. BAM Casino Parties offer a huge range of casino games to get you thrilled and jaw struck with each move. Get your feet on the floor and have a cheerful new eve’s big bash. The casino games include poker, blackjack, let it ride, three card poker, double roulette, craps and lots more to get you entertained and keep stuck in the party. We provide you with all the party needs from a playing table to the dices and cards. Get your party rentals directly to the desired spaces you need to hit the jackpot. The rental party pieces of equipment include casino tables, craps table, roulette table rental, poker table, prize wheel, pai gow and lot more to get your moods into the party evenings. Rock your evenings with BAM and leave behind all your worries. Let the party begin and set your moods to have a memorable party experience.